The Ax of Cú Roí mac Dáire — which supposedly once belonged to the Ulster king Cú Roí mac Dáire — is a fairy weapon. Though it appears too large for anyone to wield properly, those who are brave-hearted and daring may use it one-handed, as if it were no heavier than a hand axe. The Ax is one of the many treasures of the covenant of Longmist, located in the Hibernian Tribunal. 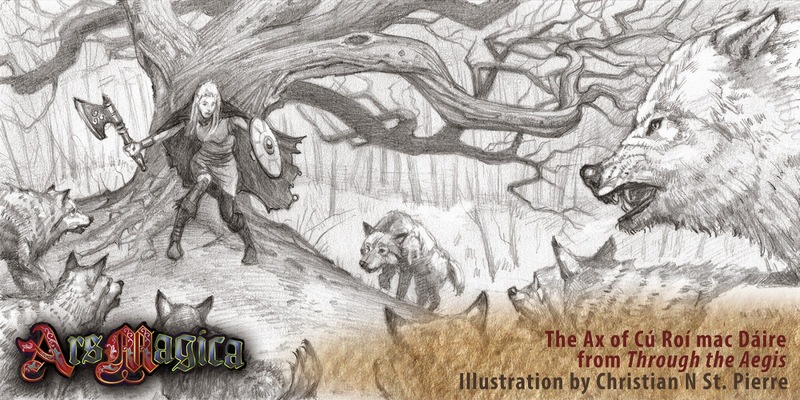 In the illustration here, a valorous companion of the covenant fends off a pack of wolves, bolstered by the Ax and the strength of her own fierce character. Your own magus may desire to draw upon this mystical energy to enchant other weapons in defense against your foes. Perhaps you seek to rid your rivals at Longmist Covenant of the weapon and its secrets. Your mentors in the Order of Hermes may have told you of the Ax's properties and are curious to know if Longmist has unlocked anything else tied to Ulster's line of mighty kings. As a companion of Longmist like the woman in the illustration, surely being granted the Ax as a boon is a sign of great status. If rival wizards were to arrive and claim it as theirs, would you fight to keep it, or face losing your new esteem in the eyes of the Primus of Longmist? See The Contested Isle: The Hibernian Tribunal for more details about Ulster and the other provinces of Ireland in Mythic Europe.